Hayao Miyazaki is no fan of modern technology. And he hates the iPad. In the July issue of Studio Ghibli's monthly magazine, Nippu ("The Burning Wind"), Miyazaki lets loose in one of his trademark curmudgeony rants against modern technology, and especially Apple's iPad. "For me, there is no feeling of admiration or excitement whatsoever. It's disgusting. On trains, the number of those people doing that strange masturbation-like gesture is multiplying." Miyazaki, of course, is no lover of modern technology, and this deep ambivalence is a common theme in his directoral work dating back to Future Boy Conan. He almost takes joy in raging against the machine, creating with pencil and paper. New recruits to Studio Ghibli are famously told to sacrifice their laptops, their cell phones - removed from the grid completely, as they hone their artistic craft. Here is the link to the Japanese blog which broke the story. If anyone could help with translating the text (Google Translator is out of its league), I'd be able to post Miyazaki's remarks here. As always, thanks for all the help. This side of Miyazaki I could do without. There are enough kneejerk reactions to new technology. I'm not saying the iPad's the aeroplane but it's hardly sin. He doesn't complain about technology when he can get animation coloured and composited so efficiently. I don't think Ponyo could have been produced so quickly were it not for 'technology'. It strikes me as being similar to those who proclaimed at the turn of the 20th century that everything that could have been invented had been already. Though without those who ignored such thoughts, Miyazaki wouldn't have ever seen a single aircraft, or animation for that matter. Having this line he won't cross seems to me to be desperate nostalgia and an old man's bitterness and despair with the world he can't keep up with. I can't stand it when he 'thinks out loud' like this and adds to his impenetrable contradictions, it's just as bad as a Roger Ebert hailing all books over video games. He says the same thing occurred in the 60s with the dawn of transistor radios, yet he happily uses those nowadays and has featured them in his films as often fond items. Just because it doesn't have cogs and splutter out steam doesn't mean it's evil. I disagree with Daniel. I think it’s an overreaction to say that Miyazaki is motivated by desperate nostalgia or despair. These are just preferences. Clearly Miyazaki creates the work environment that he finds enjoyable to work in. The ipad may not be sin or the aeroplane but it is Miyazaki's right to state his taste preferences in the company newsletter. No one is obliged to admire the ipad or be excited by it. Being ambivalent about technology is not the same as a knee-jerk reaction. For what reason does Miyazaki hate the iPad? Well, for starters, the interviewer was apparently fiddling on one while he was trying to interview Miyazaki. 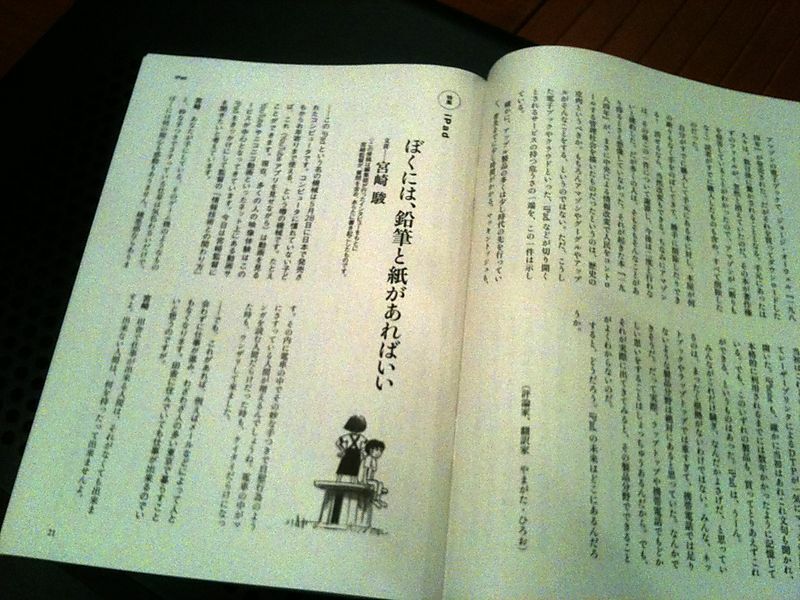 That launched the tirade against the alienating effect of iPads, cellphones, and, of all things, manga. "I’m sure in short time there will be an increase in people on trains making those strange masturbatory strokes," He says. "It was the same when everyone started reading manga on trains, and when it became cellphones – I’m fed up with it." The interviewer apparently went on to try and defend the utility of the iPad as a research tool, to which Miyazaki replied: "It may seem like I am ignoring your human rights to say this, but you can’t research any of that. Why? Because you have no way of knowing what it’s like to be on an old trireme, or having empathy with the men on board, covered in sweat as they labour at their oars." In short: "You go out into the world without enriching your imagination. You are merely grasping the iWhatever as a skimming tool you use to stroke yourself." He adds: "You jump at the newest gadgets, and all you do is relish the pride in owning one as some consumer... You must not become a consumer. You must become someone that creates." What he is railing against is not "technology". He is railing against people using anything that stands in the way between them and experiencing life, other people and the impetus towards creation and self-improvement. He may be taking that to certain extremes (I just finished reading Nausicaa on my bus commute, where I do 90% of my reading), but I can't really disagree with him in principle. Media only goes so far, then experience has to take over. I can understand the whole 'technology distances people from each other and from creativity' thing, and I'm not saying it's not true, but Miyazaki does come off as arrogant here. Judging people, putting words in their mouths. He sounds crotchety. I mean, why is he even making movies if he's so fed up with people being preoccupied by technology and entertainment? I wonder what Goro Miyazaki would think of this, considering his bitterness about Miyazaki being a workaholic and a bad father. Again, I understand the dislike of fads in technology, but I think he's being too arrogant about it. I think a lot of Miyazaki's worldview is shared by such statements and the films he makes. Miyazaki is a romantic, like Byron, Beethoven and even Kurosawa, but functioning in these present times makes him a pessimist-romantic. Often the struggle for artists is the balance they seek to reach between the world in their conscious and unconscious minds, and the REAL world out there by means of their art. Miyazaki perfectly fits this bill just like those 18th century European artists trying to reach a similar balance by re-creating glorious myths of Rome and Greece amidst a rising colonial and industrial world. The same guy who creates Totoro and Ponyo is also the same guy who wishes the end of our present day civilisation. But this pessimism drives this romanticism and vice versa. even earlier, the impact typography had was greater than any of the modern inventions.the changes people experienced 100 years ago where more radical than what we face today. It is just the switch from analogue to digital that takes place today.